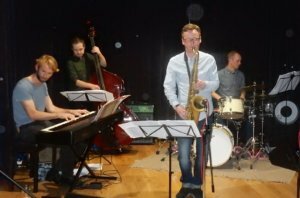 World travellers Brian Molley Quartet return to The Globe, bringing their brand of lyrical yet robust modern jazz to Newcastle once again. The Brian Molley Quartet was formed in 2012 by the Scottish saxophonist and released their much acclaimed debut album CLOCK in 2013, the success of the record leading to several UK tours, as well as performances at Edinburgh Fringe ’14 for the ‘Made in Scotland’ programme and at Rochester International Jazz Festival, New York, with ‘Made in the UK’. Whilst in the US, BMQ also performed two shows in New York City. 2015 saw the band make their first trip to India, working collaboratively with Rajasthani folk artists as well as delivering a short tour with dates in Jodhpur, Delhi, Kolkata and Bangalore. The group returned to India in 2016 to develop their collaborative work, this time recording an album of original compositions by Brian Molley fused with Rajasthani folk music. A joint project with Jodhpur RIFF, ‘Journeys in Hand’ will be released later this year.